An attractive and detailed map of the South Pacific - refers to the exploration of Australia! 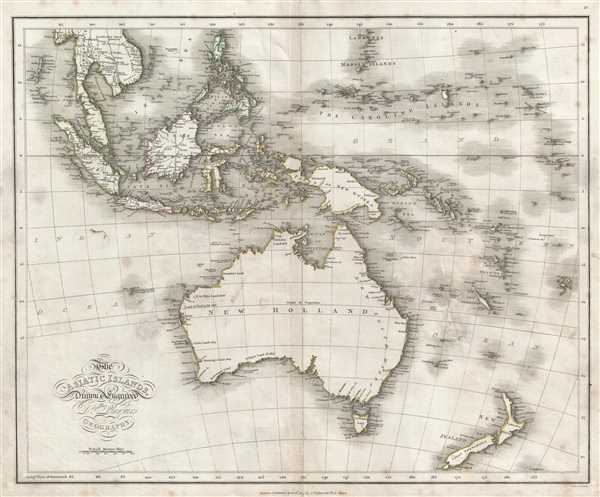 This is an 1814 James Playfair map of the South Pacific, including Australia, New Zealand, Melanesia, Micronesia, and Indonesia. The map depicts from the Indochinese peninsula, the Philippines, and the Mariana Islands to Australia (New Holland) and New Zealand and from Malaysia and Sumatra to New Caledonia and the New Hebrides. Numerous islands, large and small, are labeled, including Guadalcanal in the Solomon Islands, New Britain and New Ireland, New Guinea, the Caroline Islands, Borneo, Java, and Singapore (Sincapoor). Mindanao, Palawan, and Luzon in the Philippines are also labeled. The exploration of Australia is referenced by several different notations about the expeditions of different adventurers. On the larger islands, myriad cities and towns are labeled. Rivers are depicted and labeled on the Indochinese peninsula, on several of the islands in Indonesia, and on Mindanao. This map was published by James Playfair in 1814 in his A New General Atlas, Ancient and Modern and printed by Thomas Underwood in London and Hill in Edinburgh. Dr. James Playfair (1738-1819) was a prominent figure in 18th century Scotland. He was appointed Principal of the United College of St. Salvator and St. Leonard in the University of St. Andrews in 1799 and served in that position until his death in 1819. Playfair, J., A New General Atlas, Ancient and Modern, (T. Underwood: London and P. Hill: Edinburgh) 1814. Very good. Verso repair between Australia and New Caledonia.